Mother Joan of the Angels is a sort of sequel to The Devils (UK, 1971), Ken Russells’ hysterical and extravagant adaptation of Aldous Huxley’s The Devils of Loudon (1952) which was based on actual events that occurred in the 1630s. ‘Sequel’ because it deals with the aftermath of Grandier’s (Oliver Reed) death although it is based on Jarosław Iwaszkiewicz’s novella written in 1943 whilst incarcerated in a concentration camp. The stylistic contrasts between the film could not be more striking as director Jerzy Kawalerowicz and Tadeusz Konwicki’s adaptation eschews full frontal representation of sexual repression in favour of restraint. The stylisation in the earlier film is through Jerzy Wójcik’s stark and beautiful black and white cinematography and some striking set pieces. Apparently this is Kawalerowicz’s most stylised film as he was, predominantly, a commercial filmmaker; he’d made Night Train a couple of years before which is equally good. Mother Joan of the Angels is brilliant on so many levels: direction, performance, mise en scène and the portrayal of the psychological damage that religion can wreak. What stands out, however, is the chiaroscuro cinematography that seemingly effortlessly presents a real space as abstract. This was a very difficult film to watch for a variety of reasons. 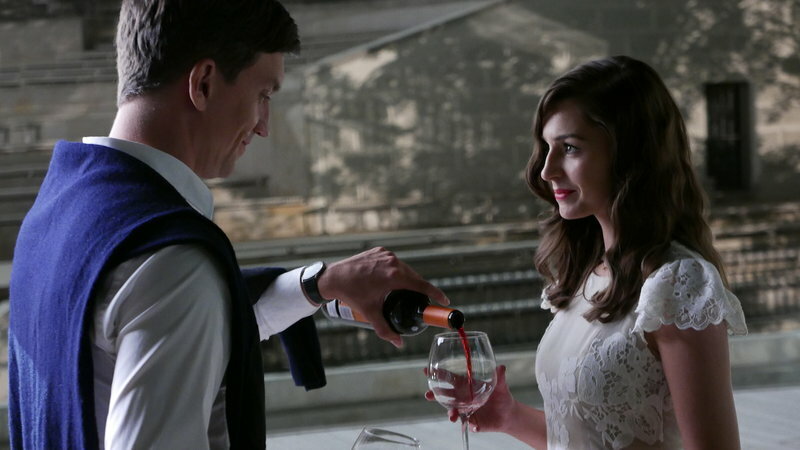 The film was introduced by its co-director Joanna Kos-Krauze who revealed that the film took several years to put together and that both her cinematographer Krzysztof Ptak and her husband and co-director Krzysztof Krauze had died before the film was completed. Since the film’s narrative focused on the ‘post-traumatic stress disorder’ brought on by experience of the Rwandan genocide in 1994 and the chosen aesthetic approach was also driven by a ‘disturbed’ mise en scène and narrative ellipses, it was clearly going to be challenging. I’m ashamed to say that I didn’t quite rise to the challenge and my concentration floundered at some points. Nevertheless, I could see that this was a profoundly moving and hard-hitting account of events over twenty years ago that are still relevant today. The central character Anna Keller (Jowita Budnik) is a Polish ornithologist studying vultures in Rwanda – the film opens with a blurred image that eventually becomes clear as a group of vultures feeding on the carcase of a cow. Anna has become friendly, even intimate, with a family of middle-class Tutsis who are the victims of Hutu attacks in Kigali, the capital of Rwanda. When the killing begins, Anna flees the country and manages to smuggle out the grown-up daughter of the family, Claudine (Eliane Umuhire). But when they arrive in Poland, both Anna and Claudine are traumatised by their experience and at first they can’t live together and Claudine opts for a hostel as she begins an application for asylum. Claudine is treated as an asylum seeker but rather unadvisedly sent to work at a fish farm where she witnesses live fish being gutted and their still twitching innards being discarded. This is far too close to the brutality meted out to Tutsis in Rwanda. Eventually she will arrive at Anna’s house and the two will agree a tentative truce before Claudine will argue to return to Rwanda to find members of her extended family (knowing this will affect her claim for refugee status in Poland). The aesthetic of the film includes use of soft focus and compositions which present disturbed images (shot through doorways or other obstacles which obscure the action). The pacing is very slow and I can’t be sure if I actually missed scenes or whether there are deliberate ellipses, so that we don’t know exactly what has been decided at the end of a scene. There have been several fiction films about the Rwanda genocide – all difficult to watch, I think. Birdsong and the squalor and horror of genocide is a powerful juxtaposition and sets up the drama of post traumatic shock. I wish I could have stayed for the Q&A when some questions might have been answered (the film has an open ending) but the curse of the film festival means I had to race off to a venue some distance away, not sure of how long it would take to get there. Birds Are Singing in Kigali is a very powerful film. As in my first screening of Casting, I wish I’d prepared myself for it. The trailer below probably says much more than I’ve been able to put into this review, simply through the use of well-chosen images and moments in the narrative. Les innocentes (previously titled ‘Agnus Dei’) proved to be a rather different film than I expected. I didn’t really have any expectations other than having enjoyed director Anne Fontaine’s earlier films such as Gemma Bovery (France 2014) and Coco avant Chanel (France 2009) and I wasn’t expecting such a powerful and deeply moving film. I found it harrowing but also deeply humanist as well as sensitive in dealing with issues of faith. It’s based on the experiences of a historical character – a French doctor who had worked with the Resistance in Paris in 1944 and risen to the rank of ‘Lieutenant Doctor’. In 1945 she became the chief doctor in the French Hospital in Warsaw, in charge of repatriation of French citizens who had been prisoners of war or wounded in Poland and the Soviet Union. Madeleine Pauliac led a team of female ambulance drivers, the ‘Blue Squadron’, searching for the soldiers who would her patients and this is how she came across the incidents developed in the film. In 1946 she died accidentally during her work. Her nephew, Philippe Maynial, was the source of this historical account which was then developed by a team of writers including Sabrina B. Karine and Alice Vial as well as the director Anne Fontaine and Pascal Bonitzer. The film narrative focuses on Mathilde (Lou de Laâge), who is younger than Madeleine and an assistant rather than the doctor in charge (and therefore more vulnerable). One day in December 1945 she is working in the hospital when a Benedictine nun is brought to her by one of the street children. The novice wants a doctor to visit the convent but Mathilde tries to shoo her away because she is only supposed to treat French citizens. When she reflects on her decision she decides to go to the convent anyway and is shocked to discover a nun in the last stages of labour and a difficult birth. Eventually she will realise that several of the nuns are pregnant following repeated rapes by Red Army soldiers. She has entered the convent secretly because the Mother Superior (Agata Kulesza) would not approve of her presence but once inside she meets Sister Maria (Agata Buzek) who speaks French fluently and acts as her interpreter and guide. Mathilde now finds herself doubly ‘disobedient’ – absenting herself from the hospital and entering the convent. She will later also find herself confronted with a group of Red Army soldiers on the dark road out to the convent in the by the forest outside the town. But there is no way back once Mathilde is committed. She can’t allow women and children to die in the circumstances she discovers. 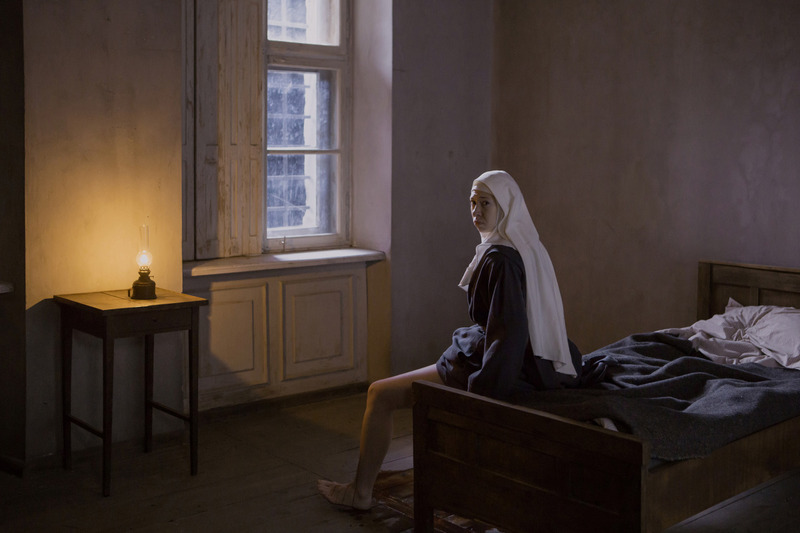 What follows is a drama that develops the conflict between faith, humanity and practicality that underpins Mathilde’s battle with the Mother Superior and individual pregnant nuns in the face of further contact with the Russians and Mathilde’s issues with her superiors. 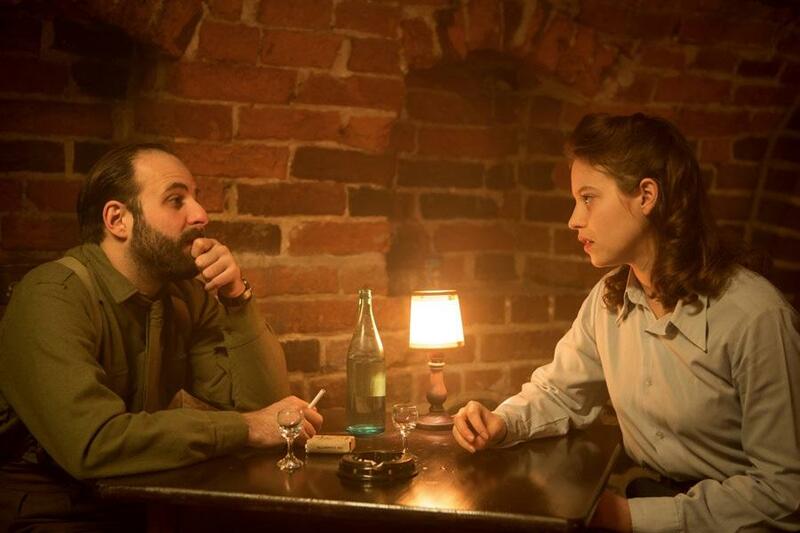 A parallel narrative follows Mathilde’s growing relationship with another doctor, Samuel (Vincent Macaigne) – a Jewish man who lost his parents in the camps while he was overseas with the Free French. At first, I thought this might be a step too far in adding another layer to the complexity of the central story but it won me over. There is an excellent Press Kit for the film available from Films Distribution and some of the following comments are drawn from it. We wanted to give the impression of being in a painting – we were thinking, naturally, of the Quattrocentro period Madonna with Child paintings – while breathing life and movement into the scenes. The air had to be palpable. This is a setting little changed from the Middle Ages suddenly disrupted by the arrival of khaki-clad men and women in jeeps and trucks. Anne Fontaine has constructed a narrative that moves effortlessly through dramatic confrontations, intimate scenes births and deaths and scenes of contemplation and prayer. I found the film’s 115 minutes sped by and I was reluctant to let it go when the credits rolled. She is graced with a strong, distinctive beauty. I sensed that this grace, combined with her slightly stubborn side, along with her freshness and a fragility that lie just beneath the surface, would well serve the film. That seems a good call. I’d finally add that the music in the film which included Handel and Rossini alongside chants by Hildegard von Bingen is beautifully integrated with a score by Grégoire Hetzel which, as Anne Fontaine suggests, is minimal and never overwhelms a film that feels intimate and natural.